I haven’t done a ridership & statistics brain exercise in a long time. However Sound Transit sent out their ridership report recently and I had to check it out. I brought it up and immediately thought about a few people always harping on TriMet in Portland compared to Metro & Sound here in the Seattle area. TriMet does an amazing job, even though some of the locals still gripe to no end. Sure TriMet could be better, but they really ought to think before they hold up others that aren’t doing so well in comparison. Let’s take a look at a few really basic examples. 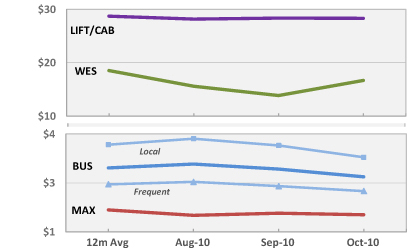 Sound Transit + Metro had the following weekday ridership on various modes. Note: King County Metro does such a poor job of keeping track of ridership with public access that I gave up even trying to figure out the cost per rider. I’m honestly appalled by the poor statistics that are publicly available. One can’t tell what the agency is doing, it really bothers me and can understand why the agency is such a blind spot of apathy for many in the Seattle Metropolitan area. This is very unfortunate. If anyone knows where or how to get this information from the agency, I’d love to know what the official statistics are. Sound Transit does a vastly superior job with their web presence, communications, and overall organization of the agency. Metro should be held to these standards and made responsible for providing at LEAST Sound Transit level public data and site standards. So to those that rant on and on about how horrible TriMet is and how wonderful Metro + Sound Transit is, check your premise. You’re way off base. TriMet costs less to the taxpayer and carries more people for that money. On a market share basis TriMet also carries almost 2x as many people in their service area as does Metro + Sound Transit put together. Of course Sound + Metro have a vastly harder job being that Seattle has allowed a complete desecration and sprawl effect to take place. Without a clear UGB and the respective funds not being blown to support suburban sprawl the transit agency has almost no hope of gaining a significant share of ridership like Portland (OR), or even more seriously Vancouver (BC) or other such city. Either way, all the agencies shown are doing a great job at a core level, but there is vastly more that should and could be done. I merely write this to state that there is an imbalance between what each agency accomplishes on a daily, weekly, monthly, and yearly basis. In the near future I’ll add Vancouver to this list of stats to show how much work truly needs to be done for a world class transit system and to up the scale, class, and efficiency in both Seattle and Portland. 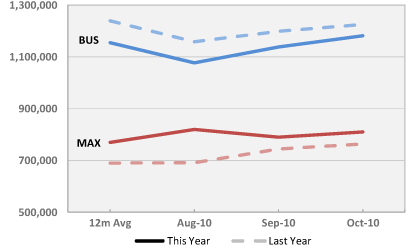 In addition to the excellent job TriMet does coming forward with these numbers and information in general, they’ve now got a dashboard to show the ongoing trends for ridership!! Check out http://www.trimet.org/about/dashboard.htm. A lot of what is stated in this spot on China’s High Speed Rail at CNN is off kilter. For instance, the train doesn’t go “into the country”, but instead generally stays in the densely populated coastal regions. It WILL create a huge industry, and even though there is something stated about the tickets being too expensive, that’s the case with airlines too. It is almost as if the burgeoning middle class of the country is disregarded. They all will be able to use this train. Naysayers the lot, but just like the Great Northern and the original railroads of the US, it’ll prove invaluable for the nation. Meanwhile, the US continues to spiral into incompetence and infrastructure neglect. Where once the US was untouchable, we’ve lagged in development and capability. Often not even able to build our own tracks anymore let alone reliable, high speed passenger trains. I just pulled up a quick route for going to Vivace Coffee from where I work near Pike Place. In other news a few Portlanders I know of have a blog I stumbled upon a pretty cool blog by a group of Londoner’s called At War With the Motorist. …and for the moment that’s all I’ve got. I hope to find out more about the Seattle Streetcar, or “First Hill Streetcar” I believe they call it and the light rail extensions soon. It seems things move slower than a glacier here in Seattle in relation to transit. A friend is moving to Seattle and in addition my lease will be up in April. To get ahead of the curve I’ve been checking out transit friendly neighborhoods around the city. Any other suggestions on awesome transit friendly areas of Seattle?